When you think of the villains in the DEATH AND RETURN OF SUPERMAN storyline, most people probably think of Doomsday. Some may also remember Cyborg Superman or even Eradicator. But few likely think of Lex Luthor, even though the classic Superman nemesis plays a major role in the story. If that’s something you’ve forgotten, you might want to check out Reign of the Supermen, the new animated movie in stores today that adapts the “return” part of the tale. As the title suggests, Reign of the Supermen introduces the four replacement “Supermen” who arrive in Metropolis after Clark meets his demise at the hands of Doomsday. It’s a part of the story that isn’t as well-known as the first chapter, and Lex plays an important role in it, both as the person responsible for creating Superboy and as one of Metropolis’ unlikely saviors. 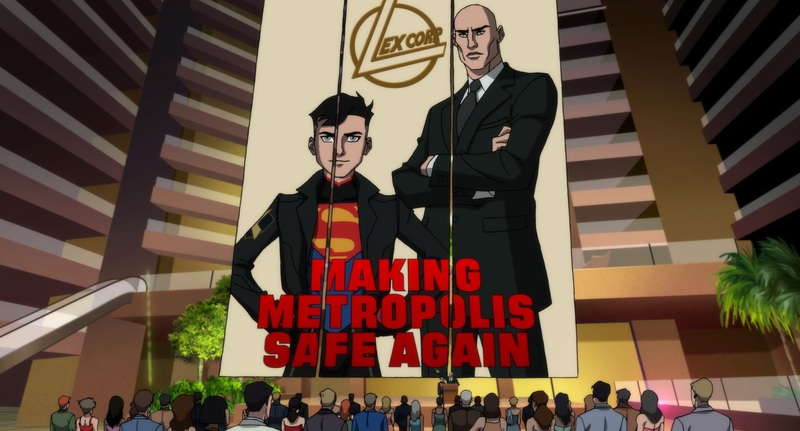 Reign of the Supermen is a sequel to last fall’s The Death of Superman, and together, the two movies paint a nuanced portrait of Lex Luthor, who’s much less a villain here than he is in the first film. That the evolution of the character feels natural over the course of two ninety-minute movies has much to do with the person voicing him—Rainn Wilson. The former Office star plays Lex in both films, creating a version of the widely known DC character that manages to feel fresh and different from the ones that have come before. We recently spoke with Wilson about the movie and his performance in it, discovering how he approached voicing Lex Luthor in both movies, along with whether he prefers playing villains to heroes, how he makes unpleasant characters so likable and whether Dwight Schrute is more of a Superman or Batman guy. Recently, you’ve played Gargamel, Harry Mudd and now Lex Luthor. Do you like playing classic villains? It’s so funny that you would lump Gargamel in there. I hadn’t thought about that, but I guess he is a classic villain! Look, I’m an offbeat guy, I wouldn’t know how to play a regular, well-meaning, do-good sort of hero. It’s just not in my DNA. So, getting to play f*cked up villains and super-villains is just a blast as an actor. They’re funnier. They’re smarter. They’re quicker and have more character flaws. It’s just a dream as an actor. As such a classic character, so many amazing actors have brought Lex Luthor to life over the years. How do you approach voicing a role that has such a history? Well, personally, my favorite Luthor was Gene Hackman’s. A number of people have voiced Luthor in the various animated iterations, but I just wanted to bring my own spin—my own vision of who Luthor is and where he sits in the DC Universe. I wanted to have fun with it and make him feel organic…and really, truly dangerous. This is one of the most famous Superman stories in history. How familiar were you with it? I’ll be honest with you. I grew up reading comic books in the ’70s, but I hadn’t really read these particular ones. I’d heard about the Death of Superman and that whole saga, so I knew that this was iconic territory. These were some of the fans’ favorite Superman stories. But I didn’t know much in the way of specifics about them. Reign of the Supermen is the story of Superman’s rebirth, but it’s also a rebirth of sorts for Lex as well. How would you describe Lex’s actions in this movie? It’s an interesting balance with Lex because sometimes he’s a straight-up super-villain and he just wants to destroy Superman. But in this one, he may always be trying to capitalize on whatever’s going on for his own benefit, but he’s also working hand-in-hand with the Justice League and Lois Lane. You see him kind of playing well with others, and having to choose between setting aside his own selfish interests for the good of Metropolis. So, that’s kind of his journey—is he going to do the right thing or not? Do you think he’s changed at all by the end? I think the pendulum with Lex always swings back and forth. Sometimes he can be trusted, but sometimes he can’t. Sometimes they need him, and sometimes he’s trying to destroy them all. You just never know. That’s the fun thing about Lex, and why audiences always love when he shows up. You never know what Lex you’re going to get. This movie introduces four alternative Supermen. Lex has a hand in creating Superboy, but is he Lex’s favorite of the four? I think Superboy, as he’s presented in this universe, is super annoying to Lex. He would much rather have created Cyborg Superman. I mean, come on! Half Superman, half cyborg? That would be totally up Lex Luthor’s alley! That would be his favorite by far. I think he’s kind of ruing the day that he created Superboy. It’s like he made an even more annoying version of Superman. Lex and Conner have a lot of scenes together. Did you get to record any of them with Cameron Monaghan, or were you on your own for your recording sessions? No, I was by myself in this one. I think it’s too hard to coordinate everyone’s schedules and whatnot. [The filmmakers] just want to listen really carefully and make sure you’re getting the script and the nuances right. So, I was solo. You seem to have a real skill with making characters likable who, on the surface, really shouldn’t be. How do you pull that off? I think that Dwight from The Office was kind of a likable super-villain in his own regard. Maybe in his own mind. Yeah, he was one of the characters I was thinking of! The more specific you’re making a character, the more likable they are. If you’re creating a character who just loves Sugar Corn Pops, they could do all kinds of dastardly things, but if their love of Sugar Corn Pops shines through, then people will relate to that. They understand that and will get behind it. I think as an actor, it’s just being really specific with the character—who they are, what’s important to them and why they do what they do. It makes them relatable. This movie has a post-credits sequence that shows Lex is far from finished. Would you like to return to the character in a future DC Universe movie? Yeah, I absolutely would. I’ve had a blast doing them so far. It’s been really fun. I love what they’re doing with these movies—revisiting these great hits from the DC comic book world and bringing them to life theatrically for the true fans. It’s a total blast and I would love to be a part of it. We’ve now seen you play an iconic Superman villain. If you had a choice to voice a Batman villain, who would you pick? The Riddler! You’ve got to go with the Riddler, right? Yeah! It makes perfect sense for you, but you don’t hear that one very often! They haven’t really done much with the Riddler, have they? Not really in the DC Universe movies, no. Yeah, that would be fun. As a kid, I loved the Riddler. I don’t know why. Maybe I just like wordplay. Everyone likes the Joker, but I always liked the Riddler. Maybe I was just more literate. Do you think Dwight Schrute would be more of a Superman or Batman guy? Well, Dwight Schrute wouldn’t like either of the characters. He would have some more obscure superhero he was into. But of the two, he would definitely be more of a Batman guy because, in the same way that he bugs Lex Luthor, Superman would be totally annoying to Dwight. Superman would bug the sh*t out of Dwight Schrute.